Can you give 10 minutes a day for R&R’s Advent Challenge? Advent is supposed to be a time of waiting and anticipation. A time to pause and prepare for the celebration of Christmas. If I am honest, for me it is far more likely to be a time smothered with extra busyness, more spending and an anxiety about getting more things done. 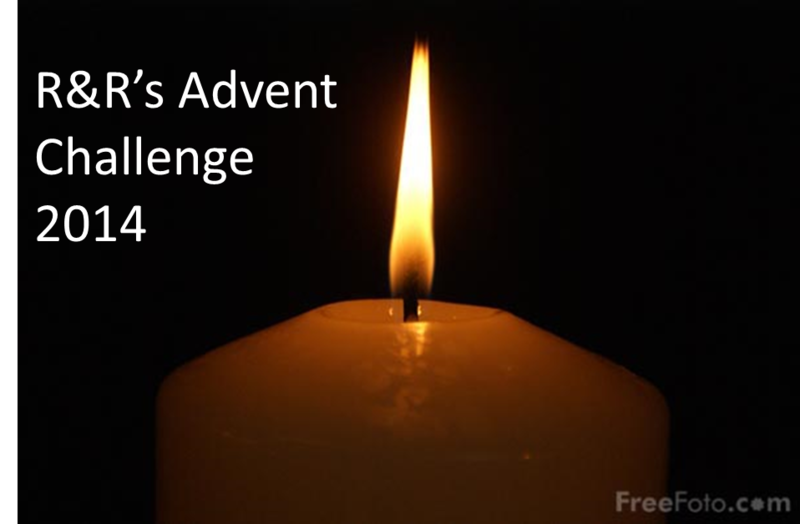 To help people like me, I have put together R&R Advent Challenge 2014 which consists of 24 days worth of short readings and reflection. The challenge is to make time every day between the 1st December and the Christmas Eve for 10 minutes of silence, reading, reflection and prayer. Download a simple, two page sheet which contains 24 days of reflections which are all based on Jesus’ words and actions in the gospels. The reflections are grouped in pairs; the ones on the left in blue focus on the destructive values to resist, and the ones on the right in green are those values which bring renewal to us and the world around us. We hope it helps you have a bit of R&R this Advent. That looks good, thank you for sharing it. Taking time out in advent can be a challenge. One of these days I’m going to retreat somewhere quiet for the whole of December! The Season of Advent is almost here. Could you take up Resistence and Renewals Challenge and pause, breathe, be and pray for 10 minutes every day during Advent?